Zimbabwe's Prime Minister Calls Election 'A Huge Farce' : The Two-Way Morgan Tsvangirai, the leader of Zimbabwe's opposition and the main challenger to President Robert Mugabe, says Wednesday's voting was rigged in favor of the ruling party. A Zimbabwean woman casts her ballot at a polling station in Domboshava, 37 miles north of Harare, on Wednesday. A day after Zimbabweans turned out heavily to vote in national elections, the main challenger to longtime President Robert Mugabe is calling the balloting "a sham election that does not reflect the will of the people." Prime Minister Morgan Tsvangirai, the leader of the main opposition Movement for Democratic Change, ticked off a list of alleged problems, including thousands of citizens who he says were thrown off voter rolls, voters being moved to different polling stations, an excess of printed ballots, and voters being forced to accept "assistance" when casting ballots. "This has been a huge farce," he said at a news conference Thursday, calling the election "null and void." Mugabe, who has been in power for more than 30 years, has denied any interference. His political party tweeted that it had won the election but quickly withdrew the claim Thursday, saying it would wait for the country's electoral commissioners to issue a decision. The results are expected by Monday. We patiently await the official announcement of the election results. We will accept any outcome. True democracy. 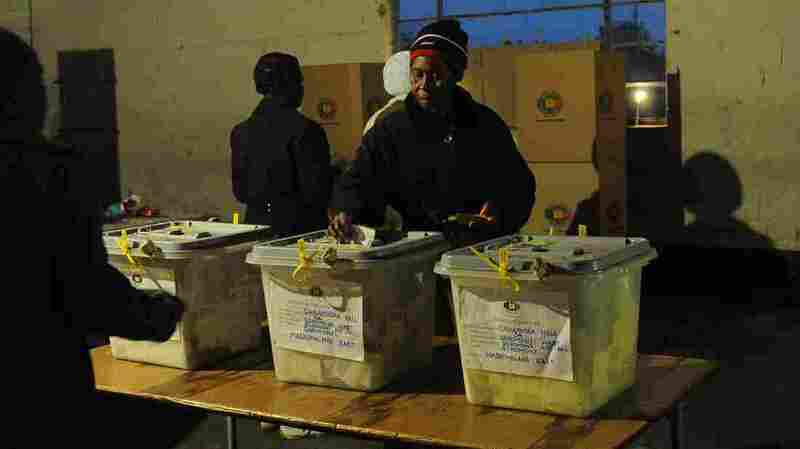 But as NPR's Ofeibea Quist-Arcton reports, Tsvangirai's opposition group is not questioning the outcome election — it's insisting the vote process is invalid. Ofeibea says there's concern that disputes about the election process could spark the kind of violence Zimbabwe experienced during its last presidential election, in 2008. It was so terrible that Tsvangirai pulled out of the contest after the first round, even though he received the most votes. A mediated settlement kept Mugabe in the presidency, while Tsvangirai became the new prime minister. The uneasy truce has lasted for four and a half years. The Associated Press reports that Solomon Zwana of the Zimbabwe Election Support Network said his group has found a "wide range of problems" in the election. He said it "was compromised by a campaign to stop voters from casting ballots. The monitoring group says as many as 1 million out of more than 6 million eligible voters were not on voters' lists." However, the head of the African Union delegation, former Nigerian President Olusegun Obasanjo told NPR that voting has been orderly. "The first place I called in this morning there hadn't been any serious incidents," he said. Tsvangirai warned that election results that are manipulated and illegitimate will plunge Zimbabwe into serious crisis.